Ganesh will be featured in the first Annapolis Blue Water Boat Show presented by David Walters Yachts at Port Annapolis Marina October 4 - 8Ganesh is the ultimate long range cruising yacht, built by Garcia Yachting, designed by Philippe Harle with interiors by Andre Rameau. The Passoa 47 is a centerboard boat, so she only draws a little over 3' to allow unfettered access to the tightest anchorages. She also has a daggerboard aft to improve downwind performance. Her tough aluminum hull is extra thick beneath the waterline, 10mm in thickness.Thanks to her integral centerboard design she is able to be run up on the beach if need be, or wait out a low tide. The fixed internal ballast allows for a low center of gravity, and she is self righting. Tankage is integral with the boats structure, and also acts as a double hull incase of bottom damage from rocks or reefs.Ganesh has successfully completed a circumnavigation, and her current (2nd) owners have taken her around both coasts of the Atlantic, from Europe, to South America, and up the US East Coast. She is only used seasonally, 3-4 months a year, and spends her off seasons on the hard. If you're looking for the ultimate in extended offshore cruising make sure to check out Ganesh. United Yacht Sales New Jersey would love to guide you through a personal showing of this 47' Garcia Passoa 47 1993. 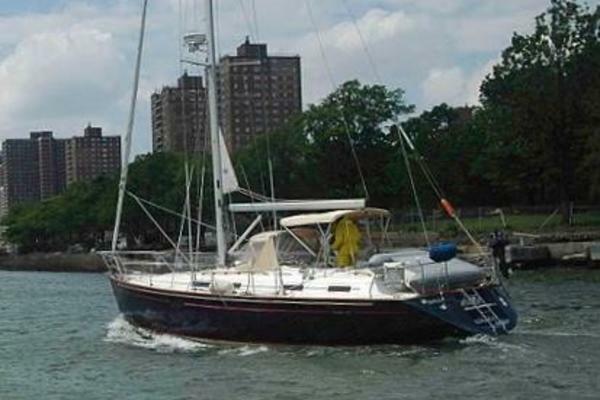 This yacht for sale is located in Annapolis, Maryland and priced at $295,000. For a showing please contact us by filling out the form on this page and we will get back to you shortly! Ganesh is a full three cabin boat. Forward is the master cabin with pullman berth on starboard, and a large vanity to port. In forepeak is the master head with watertight bulkhead forward, the bow thruster is accessed via a hatch in this bulkhead. Going aft you pass through the galley on port, with a spacious salon to starboard, fit to entertain all of your friends in the anchorage. The nav station is facing aft on starboard. To port is the aft head. Aft of the companionway are duplicate cabins with convertible bunks for single or double sized use. Ganesh is wired for 220/50Hz power. She is equipped with a newer smart charger to enable worldwide shore power conversion. Mastervolt Chargemaster 12/50-3 Charger for worldwide battery charging. Mastervolt MPPT Solar Chargemaster 25 coupled to solar array over bimini. Plumbing installed for water maker, but old water maker has been removed. Sea-water cooled refrigeration, operates on AC and DC power. Separate top loading freezer and front loading fridge. Sea and Fresh water manual foot pumps. 238 Gallons of water in two tanks, integral to hull on centerline of boat. Sea-strainers for main and genset. Single fuel tank 172 gallons integral to hull under companionway floor. Engine space access is generous with removable companionway steps and multiple side hatches. All equipment is easily serviced. Ganesh is equipped with a well thought out sail plan to enable a multitude of options no water the breeze. There is a fixed forestay for the genoa on a furler, and removable inner forestay, and baby stay for the self tacking jib. Double forestay, double baby stay, and double spinnaker halyards. Halyards are top quality dyneema or spectra with covers. Mainsail is in a stack pack with lazy jacks. 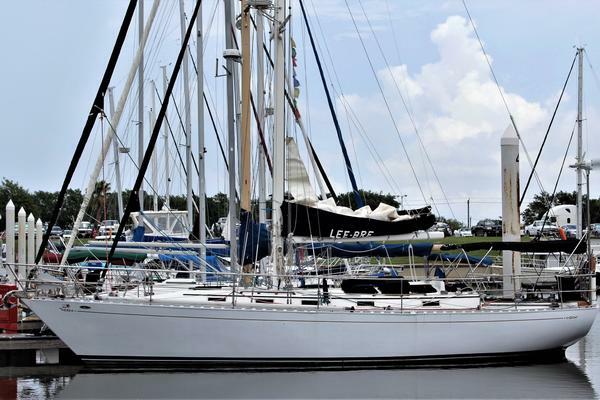 Three mast mounted winches, two for halyards and a third for reefing. The deck is spacious and relatively uncluttered with space to move about and lash down gear. Anchor chain replaced in 2015, oversized, 1/2" diameter x 260' long. Twin deep cockpit lazerettes and transom lazarettes. Anchor locker doubled as propane locker and extra storage. Step on transom with arch for dinghy and electronics mounting. Teak cockpit glued, not screwed, just cleaned, in great condition.